Get your yodel on! This Juniors Abroad adventure trip will highlight the outdoor experiences of Swiss, French, German, and Austrian Alps. We will focus on outdoor exploration at altitudes of 10,000 and higher. Traveling through Switzerland, France, Germany, and Austria will have us on trains, coaches, cog rail, and on foot as we discover historic castles, amazing vistas, world famous locations, as well as unbelievable highs (the largest ice cave in the world located in the Austrian Alps) and incredible lows (dive into a 500 year old salt mine). We will visit locations made famous by legendary recreation (Mont Blanc, Interlaken, St. Moritz) , legendary movies (James Bond 007, The Eiger Sanction, Sound of Music), historic cities (Geneva, Chur, Fussen, Salzburg) and landscapes (too many to mention)), and the notable landmarks made from war and from the avoidance of war (World War II’s Eagle’s Nest and Dachau). The intent of this tour is to view some of the majestic beauty God has created. You will have an opportunity to view some of the most beautiful scenery in the world and taste some of the classic foods from the regions we visit. We will go to favorite locations of those who travel in the region but will also have us visiting small friendly villages of the area. We will take opportunities to visit with locals and take in local culture at every stop. Language and cultural differences will become aware to us as we move across four countries and various dialects. We will look at the economics of the regions we visit, as well as the religious views and historic layers. In preparation for our expedition, we will read about the areas we will visit and study key words of each language and get to know helpful phrases. In addition to paying attention to who we are as George Fox students, where we are in our travel and how we matter, we will also place focus on recording our journey in words and images, creating a story to tell. It will be incumbent upon us to become storytellers for those who won’t be on the trip and may never be able to see what we have seen. WARNING: Ability to walk reasonable distances (up and downhill), climb stairs, and breathe comfortably in high altitude is essential. Day 2-3 We arrive in Geneva, Switzerland– “Switzerland’s World City” – checking out the local area and getting over jetlag. Visit the United Nations Headquarters, Old Town, the Geneva watch tour, Cathedral of Saint Pierre, The Reformation Wall, Lake Geneva, an archeological site, International Red Cross Museum. Options: (1) Take a bus trip to Haute-Savoieand ride the cable car up Saleve mountain (“the balcony of Geneva” in France’s pre-Alps). (2) Take the train to Chillon Castle in Montreux, Switzerlandvia train, also visiting the Olympic Museum in Lausanne, Switzerlandalong the way or take the very steep cog rail to Rochers de Naye(6,600 ft) to see the rare Edelweiss flowers. Day 4-7 We will take the train from Geneva to Chamonix-Mont Blanc, Franceto enjoy the amazing French Alps and recreational opportunities, including the incredibly steep cog rail up Mont Blanc, taking gondolas to the 12,605 foot elevation of Plan de l'Aiguille, and hiking in the valley. Options: Day trips are available to Mont d’Arbois and a cable car trip up the mountain, Nature Reserve of Rogue Peaks, and/or hiking at Val d’lsere. Day 8-11 Next, we head back into Switzerland, taking the train to Interlaken, Switzerland. We will follow in James Bond’s footsteps, going to the top of the Schilthorn and taking in the views, as well as the James Bond Museum. Our 360 degree view gives us a close up look at Eiger, Monch, and Jungfrau – all a part of the Swiss Alps. Something you won’t soon forget is “The Adventure on Mount First”. This wild ride includes a zip line, gravity-fed go-cart and a stand-up bike as you make your way down the mountain. Options: From Interlaken, the train can take you almost anywhere you want to go, including the Matterhorn and to the Sphinx Panoramic Terrace, with Switzerland’s fastest elevator to the top (going up 400 feet in 25 seconds). Locally, you can choose from paragliding, canyoning, whitewater rafting, jet boat ride, mountain biking, and hiking. Day 12-13 We now take the historic Glacier Express railway into Chur, Switzerland(the oldest city in Switzerland). In Chur, we will stay in their old town and visit museums and shops as we walk along the Rhine River. We will go to Churwalden for the Guinness Record Holding “Longest Toboggan Run in the World” (and an amazing ropes course). If the resort is open, we will take a day trip to Arosaby train, summiting the Weisshorn by cable car. 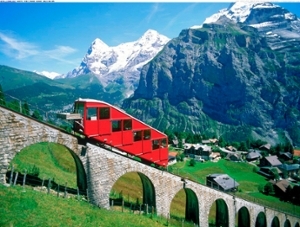 Options: Glacier Express to St. Moritz to see the most popular holiday destination in Switzerland. Day 14-17 Traveling by coach, we’ll head to Fussen, Germany, home of the Neuschwanstein Castle (i.e., “Crazy Ludwig’s Castle”). Another castle, not to be missed, is the Hohenschwangau Castle. A day to shop will be a highlight in this delightful German village. We’ll take a day trip to Zugspitze (Germany’s highest mountain) in the German Alps, visiting Garmisch-Partenkirchen and Partnach Gorge with resort activities and hiking. Options: Linderhof Palace and Oberammergau (home of the once-a-decade Passion Play). Day 18-20 Following a fun and castle-filled time in Germany, we’re off to Salzburg, Austria via coach. Before we arrive in the beautiful city of Salzburg, we will stop at Berchtesgaden and The Eagles Nest (Hitler’s strategic bunker). Once in Salzburg, we will visit the Hohensalzburg Fortress, old town, and sites from The Sound of Music. A full day trip includes a trip to the historic Salzburg Salt Mines and the Eisriesenwelt Ice Cave (the largest in the world, climbing up and down 1,400 steps. Options: The 900-year old mountaintop Hohenwerfen Castle (featured in the World War II movie ”Where Eagles Dare”). Day 21 To end our trip, we will fly out of Munich, Germany. To make our travel morning easier, we will take a coach to Munich the day before, allowing us to visit the Marienplatz, home of St. Peters Church (the oldest church in Munich, featuring 299 steps to the top of the spire), and the famous Neues Rathaus Glockenspiel. At the Marienplatz, we can expect to have the best bratwurst on the planet. Day 22 We head for home from the Munich airport.